Amazing! 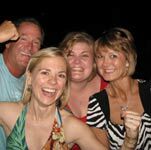 When we rolled up to register for our site at Castaways RV Park & Resort on Lake Conroe, my daughter and her family from Austin were getting out of their car and our good friends from Dallas were inside registering for their site. Was that a sign that all would go well for the weekend? It must have been because we had a blast camping, playing tennis, swimming, golfing, exploring Lake Conroe, dining and dancing, tubing, and more. 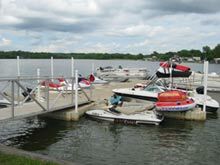 Most of the RV sites are set under the trees and some offer a view of the lake, but they are not on the water. The sites are not the best we have encountered and the park is in need of some maintenance but the park amenities and close proximity to the water more than make up for all that. There are some great tent sites (no RVs allowed) that are along the water. 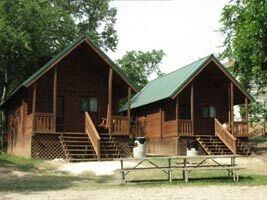 If you don't want to camp, Castaways has 6 cabins that are adjacent to the ramp and have excellent water views. The cabins sleep 6 to 8 people, are fully equipped with a kitchen, utensils, linens, TV, AC/heating, and they are perfect for a small family. 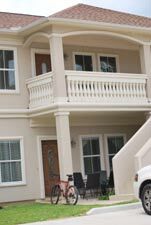 On our stay, we had two RV sites and one of the new condominiums that just opened - and they are fantastic. The condos are available for sale and until they are sold some of them are in a rental pool. The condos are about 150 yards from the water and from each of the units you have a view of the lake. The condo that we stayed in had two bedrooms, two bathrooms, dining and living room, TVs, and a full kitchen. 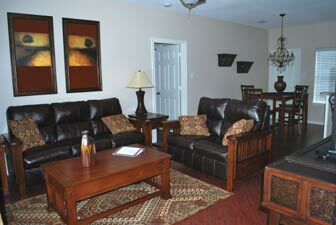 Ours was very well done with wood floors, soft leather furniture, marble countertops, and all the comforts of home. The kitchen is well stocked with everything you need to cook all fish you catch on the lake. When you stay in the condos you have full access to all of the resort amenities. 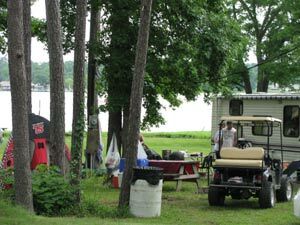 A perfect place to stay for a weekend or longer.Castaways is a member only RV park, but the cabins and condos are open to the general public. If you are willing to take a tour and listen to the sales pitch, you can reserve a site for the weekend. You can learn more by reading our review of Castaway's RV Resort. As soon as we had settled in and checked everything out, we piled in the boat and headed out for dinner, drinks, and music on the lake at Grampy Larry's Lakehouse Restaurant & Pub. 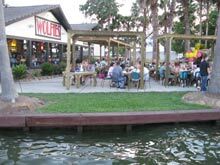 What a great way to start the weekend - good food, a very fun waitress (Brandi), a guitarist playing some good sounds, fantastic drinks and cold beer, and a beautiful deck overlooking a cove - can't get much better than that. The sunset was phenomenal! 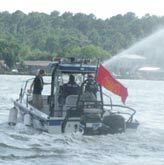 We love Lake Conroe because it offers a little bit of everything that makes lakes fun - good water (not real clear, but not too many Texas Lakes are clear); some coves for skiing/boarding, swimming, or fishing; some great cruising by Bentwater Golf Course and their huge beautiful homes; good lakeside dining; and some fun bars on the water with live music. 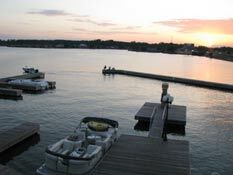 To learn more, read our review of Lake Conroe. 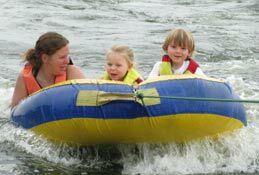 found some good coves to take the grandkids tubing - first time for them and they never wanted to get off. 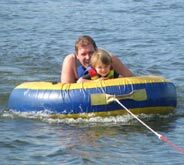 After watching the grandkids having so much fun, my brother, who recently moved to Austin from Portland, Oregon wanted to try tubing. Everybody warned him that I had a reputation for easily flipping adults off the tube. 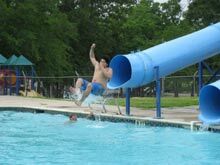 He claimed that I couldn't toss him off the tube - "No pontoon boat is going to throw me off the tube!" Polly Pontoon Boat and I accepted the challenge and he was a goner and sucking water in the first two minutes! This was the first of many of his going down in our competitive activities over the weekend which included golf, tennis, horseshoes, ping pong, washers, bochee ball, ladder golf, dominos, and lots of card games - Big Brother Rules! 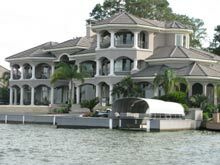 cruised by and marveled at the huge beautiful homes, a majority of which are in Bentwater, along the Lake Conroe shoreline - where does all that money come from and why don't they want to share it with Texas Outside? 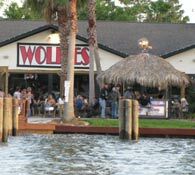 spent a fun evening eating and drinking on the deck at Wolfie's (ok food, good drinks, great deck, kid friendly, lively) and then boated over to Papa's to end the evening. Papa's is fantastic with food (a limited menu with burgers, sandwiches, and appetizers), outstanding decks, plenty of boat parking, a small pool, video games and pool tables, and sand volleyball - it wasn't a great idea for us to try playing sand volleyball at 11 PM after several drinks - not a pretty picture and I'm still finding sand in the boat and various body parts! The country band playing that night was fantastic and the grandkids stole the dance floor and little Bro got to introduce the band! Check out this cool lake map for Lake Conroe - you'll find restaurants, ramps, marinas, golf courses, campgrounds, and more. 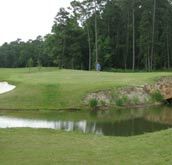 The Lake Conroe area is a golfer's heaven with plenty of choices for some fun, challenging, and beautiful courses. We played at Wedgewood Golf Course in Conroe. What a fantastic course and little Bro went down again - I'm sure glad he moved from Portland, I enjoy taking his money! Wedgewood has something of everything that makes golf a lot of fun and keeps me coming back regardless of how poorly I play - lots of ups and downs and elevation changes (some of the holes remind me of a roller coaster ride), dog legs, blind shots, risk reward opportunities, water, bunkers, and challenging greens. Wedgewood Golf Course is well worth going out of your way to play. To learn more, read our review of Wedgewood Golf Course. 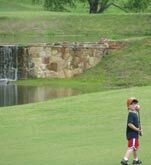 Check out this map of Lake Conroe golf courses - you've got lots of fantastic choices. 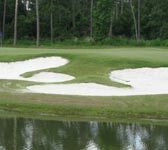 We have played a number of courses in the area and enjoyed all of them. You'll find reviews of the courses on our Golf Course Reviews Page. Fun and busy Memorial Day weekend - I was ready for a long nap on Tuesday!